Looking for easy Halloween bat craft ideas? These 13 fun bat crafts are perfect for the classroom or to make with the kids at home. Bats are often found all over Halloween decorations due to their creepy and spooky nature. They come out in the dark, at night, which makes them a great symbol for Halloween. 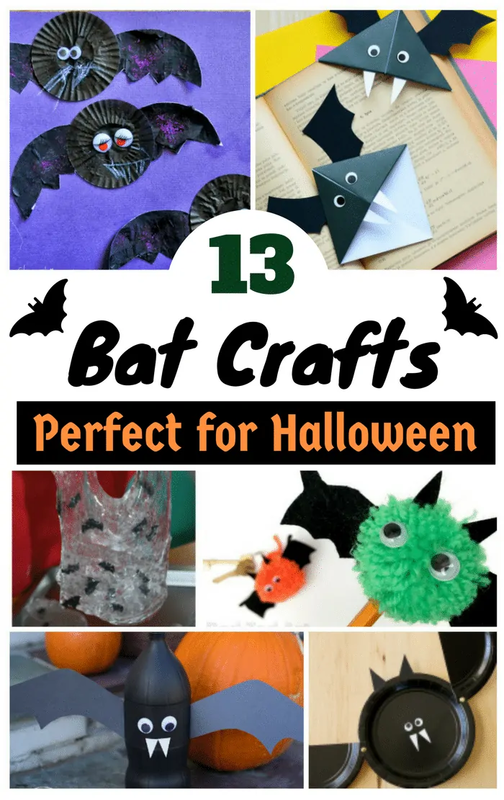 That is why bat crafts are so perfect to make with the kids to get ready for Halloween. Below you will find plenty of terrific bat craft ideas from craft bloggers all over the web. From paper plate bat crafts to handprint bat crafts, you are certain to find plenty of fun ideas! These adorable little pom pom bats are simple to making using common craft supplies that you will likely already have in your craft stash. They make great pencil toppers or keychains as well! If you would like to make a bat craft that you can then use to decorate for Halloween, these fun cupcake liner bats would be a great option for you. They are easy to make and look great hung up as a Halloween decoration. Upcycle those old egg cartons to make this great bat art project. These egg carton bats will look great hanging from the ceiling when they are dried. Not gunna lie, paper plate crafts are one of my all-time faves. Make a classic paper plate bat with this easy tutorial. As you all know, I also love a good homemade slime. Make a fun Halloween slime with this bat slime. Related: check out this DIY monster slime that would also be perfect for the kids on Halloween. After making this easy bat hair bow your little one can wear it in their hair to get in the Halloween spirit. Not to mention, it is super adorable! This bat-themed craft helps the little ones work on their scissors skills while making a fun art project perfect for Halloween. These bat bookmarks would make a great Halloween craft idea for older kids and tweens, as it does require some strategic folding. Don't be intimidated though, this craft is still super simple to make. Transform your pumpkin into a spooky bat with this simple no care bat pumpkin tutorial. I just love how cute it comes out! This Halloween craft is easy to make even for the littlest of hands with some help from mom, dad, or teacher. A unique craft that uses conker shells to create little bat pencil toppers. These toppers are perfect for using in the classroom the days leading up to Halloween. If you are short on craft supplies, this paper bat is a great option. All you really need is some paper, crayons, and googly eyes. If you don't have black paper you could even use white paper and paint or color it black. Either way, this is a fun craft! Another great way to upcycle is with this soda bottle bat craft. Plain old 1 liter soda bottles make for the perfect bat body – who knew?! Still looking for more Halloween craft ideas? Check out these witch crafts! Which of these spooky bat crafts will you be making this year?